A new frontier for CTV News: a podcast — about us! When people ask what I do for a living and I tell them "I’m a TV news reporter," I feel like I haven’t given them a proper answer. Many people have an idea of what we do that's informed by TV shows and movies – the portrayal of the dogged reporter going it alone, fighting adversity to tell a story no one else will tell. But the reality is, it takes a lot of journalists to put together each story you see on a 6 p.m. newscast, with even more technicians and support staff to get that newscast to air. Most days it’s a systematic collection of good video, verification of facts and meticulous writing and editing that come together fairly smoothly to convey an issue or incident we think our viewers should know about. Sometimes our days involve confrontations with suspects, obstruction by PR handlers and interviews that can inspire or crush the soul. 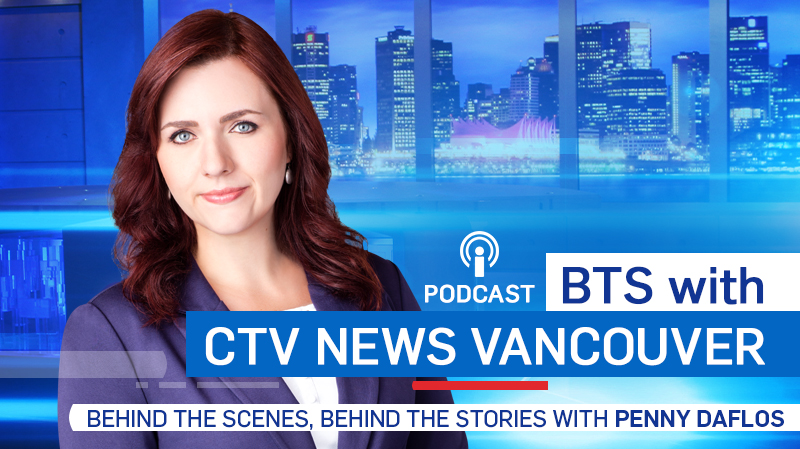 Starting today, you’ll be able to hear about those exceptional, fascinating and frustrating encounters on a weekly podcast from the CTV Vancouver newsroom. BTS with CTV News Vancouver will take our listeners behind the scenes and behind the stories. As CTV’s first original podcast, I’ll give you an unfiltered look at how our stories and newscasts come together. Did you know our directors in the control room are a special combination of computer programmer/artist/talent manager? How would you like to hear from one of the few female news videographers in the country, who’s been shooting exceptional video for CTV Vancouver since our station launched? And how do Mike and Tamara handle those stressful moments when they have to go off-script because there simply isn’t one? It’s fascinating hearing that unflappable duo talk about what makes them nervous! I hope you take the time to download this little pod and join me behind the curtain of what may be the most passionate, fun, hard-working and creative newsroom in the country. Click here to listen on Apple Podcasts, Google Play, or Stitcher.